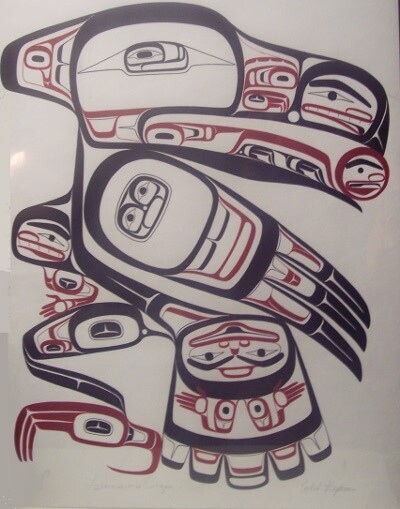 Todd Stephens is one of maybe a dozen First Nations artists whose work I watch closely. A graduate of the Freda Diesing School and two-time winner of the YVR Art Foundation Scholarships, he paints in a style that is traditional, yet displays his technical skill and individuality. “Jorja and I,” a painting of Stephens and his young daughter, remains one of my favorite pieces in my collection, hanging above my workstation. So, a couple of months ago, when Stephens was selling another major painting, “Txeesim’s Escape,” (“Raven’s Escape”) I jumped at the chance to buy, also purchasing two smaller pieces, “Midiik” (“Bear”) and “Ganaa’w” (“Frog”). To my surprise, I’ve heard another art buyer dismissed Stephen’s work as scholastic, suggesting that he hadn’t evolved a style of his own. However, that description confuses classicism with lack of originality. In a classically oriented piece in any field of art, what you look for is discipline, and originality within the tradition. By these criteria, Stephens’ work sets a high standard – in fact, it often shows a surprising amount of variation, even with the same piece. Look, for example, at “Ganaa’w.” Even in this relatively simple piece, the formline varies from the length of the back to the thinness of the hind leg, parts of which are half, or even a quarter the thickness of the back. As you trace the formlines, you will also find variations in how they are joined, with most tapering long and dramatically in the primary black formlines, and often hardly at all in the secondary red formlines. Notice, too, how often the black formlines create a T-shape out of negative space, especially at the throat and the base of the back, reducing the overall weight of the forms. The contents of the ovoids shows a similar variation in their contents, although the feet, naturally enough, are nearly identical. 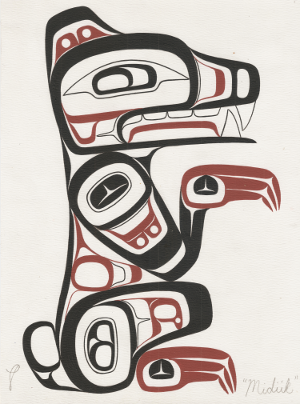 Many of the same things happen in “Midiik.” In this piece, though, the thick black formlines are used together with the ovoids and U-shapes to create a sense of the bear’s powerful legs – in fact, there is a distinct impression of musculature in the upper legs that, more than the claws or the rough outlines of the teeth, convey a sense of the bear’s strength. Another interesting aspect is that the asymmetry of the eye leaves the impression that the bear is looking out at the observer, possibly in a menacing way. However, of these three pieces, “Txeesim’s Escape” is by far the most accomplished. 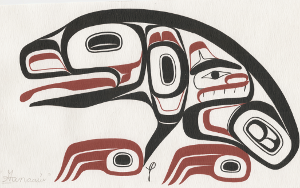 The title refers, of course, to the story or raven causing himself to be born as the grandson of the chieftain who keeps the light in a chest so that he can steal it (you can see the light at the tip of his beak, and the shape of the grandson in the tail). It’s an old story, and one that I sometimes think is depicted too often at the expense of equally interesting stories, but one that can always be renewed by originality or craft, as Stephens proves. The design of “Txeesim’s Escape” is a bold one. It makes me think of house-fronts, the decorative boards that the northern First Nations of British Columbia brought out of storage to decorate their longhouses during celebrations. Evidently, that is what Stephens had in mind as well, since the painting is not only just short of three feet by two, but also so busy that many of the details are lost at a smaller size. The design is economical. The raven’s body is hardly shown at all, except for a thick formline. Instead, the design is dominated by the head, wing, and tail, with a single foot whose main purpose is to balance the design. These body parts are shown in a profile that would be almost impossible to hold for any bird to hold for more than a second in reality. Here, though, the position suggests startlement, as though the raven has heard or glimpsed something behind him, and is flashing a quick glance over his shoulder to check for pursuers. But the most outstanding feature of the design is the sheer amount of variation in the ovoids, U-shapes, and other elements within the form lines. The amount of variation seems almost disorganized in the tongue and upper beak, but Stephen keeps it partly in control in the wing and tail feathers by having the design elements in the outer feathers match. As for the many faces in the ovoids – or appearance of faces – they serve as a reminder that the raven is a master shape changer, capable of assuming many forms. The overall impression is a pleasing confusion that seems not only suitable to a creature being chased, but completely appropriate to a being that is, in many ways, the embodiment of chaos. I have no idea how conscious Stephens is about such things – some artists are very conscious of the effects they create, while others are either unaware or wary of examining the process too closely. However, these comments should be enough to show why I consider Stephens an artist skilled in working in a classic mode. He displays his work regularly on his Facebook page, and is currently selling glicée prints of the four main clan crests at a surprisingly affordable price.